The Resistance priests maintain they are carrying on the authentic teaching of SSPX founder Abp. Marcel Lefebvre, which was to “recognize” the Vatican II popes as true popes, but to resist on a case-by-case basis papally-approved teachings, laws and commands that the archbishop and others decided were evil or erroneous. This position is now generally referred to as “R&R” or “Recognize and Resist” — a label, by the way, that I myself coined in a December 2005 article in The Remnant. Several years ago, I circulated a video which summed up the position as The Pope Speaks: You Decide: Traditionalists Who Destroy the Papacy. As I and others have repeatedly pointed out, the R&R position simply cannot be reconciled with traditional Catholic teaching on the indefectibility and the infallibility of the Church. Once you say (as all traditionalists do) that the officially-approved post-Vatican II teachings contain error or evil, the only logical conclusion you can come to is that the men who promulgated them had no authority when they did so — sedevacantism, in other words. Otherwise, you wind up with a defecting Church. 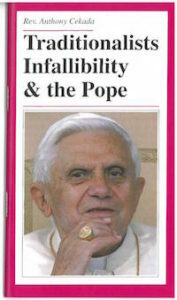 I made this argument in a 1995 article Traditionalists, Infallibility and the Pope (since revised in 2006), which has since then been widely circulated as a booklet (at least 30,000 copies) and on the internet. No one that I know of on the R&R side has, in all these years, published a credible refutation of this rather short work. When a correspondent of mine challenged Fr. Chazal to do so, Fr. Chazal produced a seven-part, thirty-nine page monograph entitled “Contra Cekadam,” which is now being circulated in installments on the internet. The following brief comments to a correspondent will suffice. Thanks for sending along the Chazal document. It is hardly, as Fr. Chazal seems to think, a point-by-point refutation of my argument in Traditionalists, Infallibility and the Pope. If Fr. Chazal agrees with the statements in points 1 (the changes are evil) and 2 (and the Church, by Christ’s promise, cannot give evil/error), but he nevertheless still insists the Vatican II popes are true popes possessing authority from Christ, he maintains in effect that the Church of Christ has defected and that Christ’s promises are void. Recycles opinions on a heretical pope that were eventually abandoned after St. Robert Bellarmine. 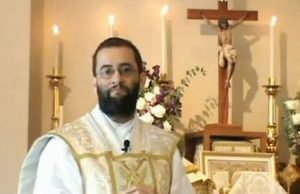 Attempts to apply criteria pertaining to ecclesiastical crimes when sedevacantists maintain that the public sin of heresy, not the crime, is what prevents a heretical pope from obtaining or retaining the papacy. Refloats the phony Adrian VI quote. Repeats the Paul-vs-Peter canard [see Appendix at end of the post here] on fraternal correction for a moral fault, which does not solve the problem of the Church defecting wholesale by promulgating theological errors and evil universal laws. Recycles supposed incidents from history to demonstrate that there have been heretic popes before, but which incidents (a) are part of the standard arguments of protestants who reject papal infallibility, and (b) have been repeatedly refuted by Catholic dogmatic theologians. Evil changes + true popes = defected Church. Good luck getting out of that one, Father Chazal! This was written by Rev. Anthony Cekada. Posted on Friday, August 25, 2017, at 3:48 pm. Filed under Sedevacantism, Sedevacantism: Objections, Trad Controversies. Bookmark the permalink. Follow comments here with the RSS feed. Comments are closed, but you can leave a trackback.